Mene did several smaller models of Foxes during his career but this standing Fox is larger than most. This Fox was used as part of the group of Two Hounds Cornering a Fox but it works very well as a single sculpture. The Fox is standing slightly crouched with his mouth open as he snarls. 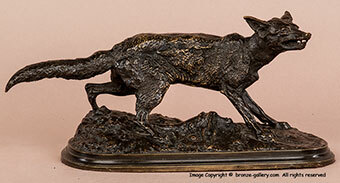 The fur texture and detail is excellent in this bronze which was cast by Mene in his own foundry. The bronze has a good dark brown patina and is signed and dated 1847 on the base. 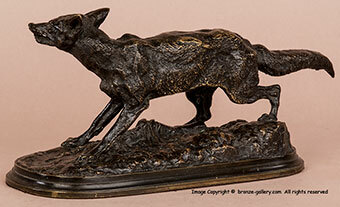 The model of the Two Hounds with the Fox was done in 1849 so the single Fox was created before the larger group.